Data binding can be used to display the contents of a data cell as content in your layout or it can be used to alter a wide variety of display properties of this content. Create a new layout and add a "single" text zone on it. In the Create a data binding dialog box that appears, select Sheet 1, data cell A1. Switch to the Data Manager module and select the same data cell and enter data into it. 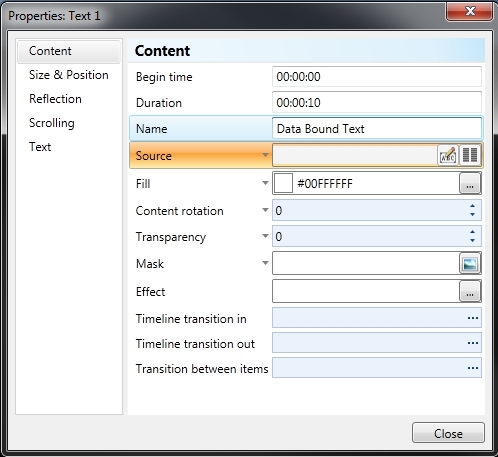 Switch back to the Layout Designer module and open the Properties dialog box of your text content. An arrow beside a property name in the dialog box indicates that this element's value can be data bound. The orange highlight on a property indicates that the property is currently data bound. This indication also occurs on the main application ribbon. 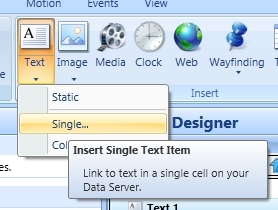 The Create a data binding dialog box appears. Select a data cell located at Sheet 1, data cell A2. 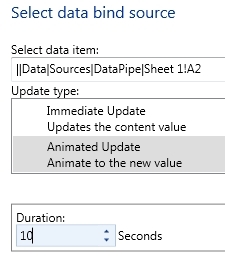 From Update type, select Animated Update. Switch to the Data Manager module and enter 700 as a numerical value into the data cell at Sheet 1, A2. Return to the Layout Designer module. If you do this fast enough, you will see the text box moving down screen. Do this several times with different number values and observe the changes. This is very basic Data Binding. It is a simple concept that offers great flexibility when designing your content.